Palo Alto Networks and Bradford Networks offer an integrated solution that extends application, content, and user-based firewall policies to mobile devices. By correlating network events to infected endpoints, the joint Palo Alto Networks/Bradford Networks solution bridges the silos of information to maximize network visibility, remediate compromised or vulnerable devices, and minimize threat response times. 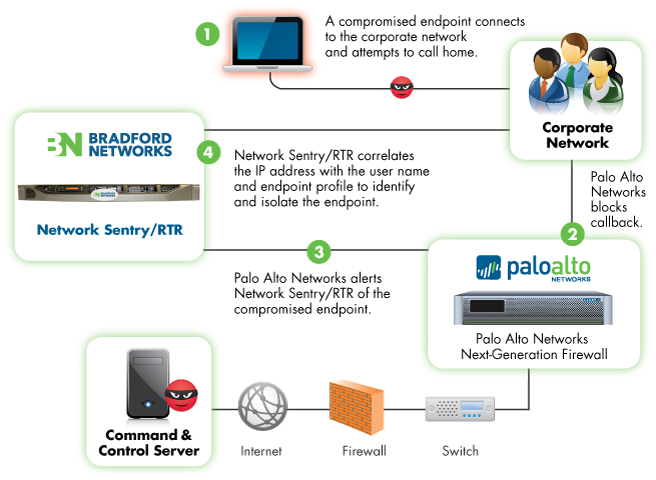 Download the Bradford Networks' Network Sentry/RTR for Palo Alto Networks Solution Brief (PDF).